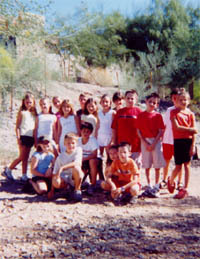 Students from Desert View Learning Center in Paradise Valley, Arizona, have taken an active interest in their local environment. Led by teacher Raimie Manch, this fourth grade class has studied the ecosystem of their schoolyard and the culture of the region. What is even more exciting about these young scientists is their work to increase local biodiversity. HORIZON commends these solution-oriented youth and their dedication to protecting their environment. 1. The desert can get up to 124 °F in the summer. 2. 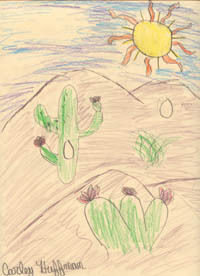 The desert here is called the Sororan Desert. 3. We have paloverde trees here. People hike, find rocks, and ride horses. Facts: You often see bald eagles and hawks. The desert is hot in the summer. In the winter it can rain. 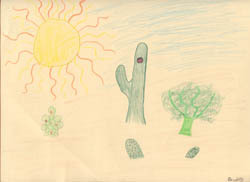 The desert has a lot of cactus. 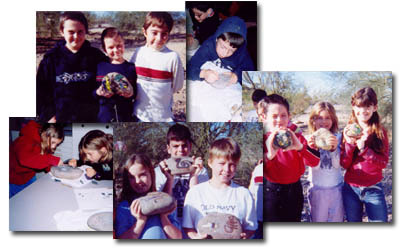 To beautify their schoolyard, teach kindergarten students about the animals in the desert, and scare away a few rabbits, Raimie's students created picture rocks. Students observed that rabbits were threatening the biodiversity of their schoolyard, so as a class they created four foot tall rock planters and filled them with native flowers. Students have already noticed more birds and bees in their schoolyard, an increase in biodiversity as a result of their creative solution. 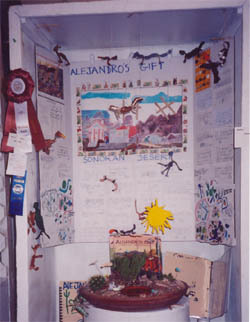 The class went on to win awards for their environmental project based on the book Alejandro's Gift. Their exhibit included clay models and puppets, and they wrote a play based on the story. In addition, their indoor garden won the prize for the best garden exhibit, and they also took home the most educational award.